Goldstar is currently offering FREE complimentary event tickets to several local venues throughout Southern California. It’s like “Christmas in January” for those of us who enjoy taking our friends and family out to see a special show in Orange County or visit a local Southern California museum or explore a new entertainment venue in Los Angeles. It’s also like finding gold at the end of a rainbow! Please note, there is a small service fee per complimentary ticket, but it is still an awesome deal for local families who want to spend a day out on the town. 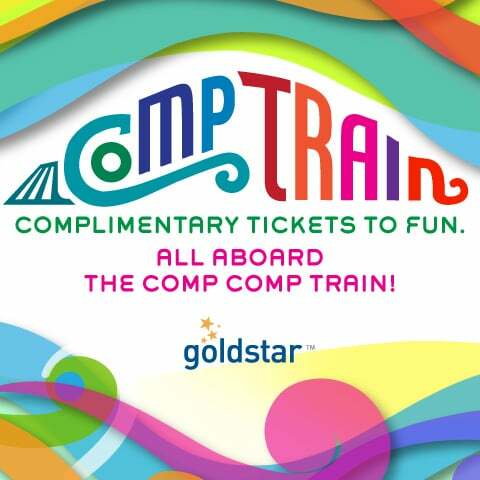 The key to Goldstar’s Comp Train is to order your tickets right away! Otherwise, they will be gone the next time you visit Goldstar’s website. So grab a ticket and have fun! California is America’s largest and most diverse state, home to people, traditions, languages and ideas from every corner of the world. California’s dynamic population, culture and geography have made a notable impact on the state’s artistic output, which has long been defined by a spirit of freedom and experimentation. This spirit is always on display at the Pasadena Museum of California Art, which showcases works by California artists in exhibitions like “In the Land of Sunshine: Imagining the California Coast Culture”, which features paintings of California life from the past 150 years, and “”a sky in the palm of a hand””, which pays tribute to local artists Lloyd Hamrol and Joan Perlman. This is the most dazzling display of gems, jewelry, beads, accessories and minerals you’ll ever see under one roof. For more than 45 years, the acclaimed International Gem and Jewelry Show has been bringing the largest selection of jewelry at the lowest prices to locations across the country — and now the show is back in town. You can expect to find colored gemstones, exquisite fine jewelry, gold and silver earrings, necklaces and bracelets, beads and crystals, ethnic jewelry, classic pearls, vintage estate jewelry, engagement rings and wedding bands, designer watches and one-of-a-kind seasonal pieces. With a huge selection and special show pricing direct from worldwide designers and manufacturers, this show is perfect for gem enthusiasts, jewelry lovers and those of us looking for unique new accessories at a great price. Jump-start your creativity and immerse yourself in beauty during Art Palm Springs over President’s Day weekend. Featuring works from over 60 international contemporary and post-war art galleries, the event takes place in the shadow of San Jacinto Peak at the Palm Springs Convention Center. Dozens of artists will be in attendance to discuss their work with you as you browse and admire the exhibits. Art Palm Springs coincides with Modernism Week and the launch of Desert X, an international, contemporary art exhibition in the Coachella Valley. The hottest team in town is the Ontario Fury, which kicks off its fourth season in the Major Arena Soccer League with intense indoor soccer action. The team is made up of rising stars and veterans from the MLS, the nation’s top collegiate squads and international players — all under the tutelage of experienced coach Bernie Lilavois. Bring your family out to beautiful Citizens Business Bank Arena and enjoy the fast-paced action of the world’s most popular sport. First time requesting comp. tickets, I have about 10 kiddos that would love to go. Each company decides what deals they want to offer. I would rather get a comp ticket for an adult though b/c those tickets cost more in general vs. a child’s ticket. I hope that helps. How do I get tangled tickets ? You would need to call the theater where the show is performing to find current rates and times. If you Click on each event link, you will see how to get the tickets. I would love to take my family to some fun events! They are fun. Click on each event link and you will see how to get the tickets. I do not see the comp tickets for the whale watching. Did I miss something or do I need a code? As of yesterday, they still had comp tickets listed. Perhaps they sold out of that deal. They do go super duper fast! Also, there is a small service fee per comp ticket, usually around $3 each if they are comps. More otherwise. When I click the link for the whale watching, its not free. They charge $13 a ticket plus $6 surcharge. Did I miss the deal already ?